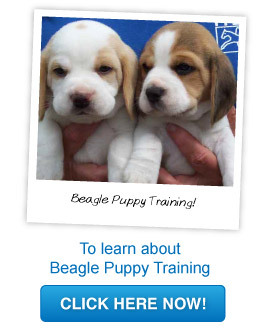 As soon as you have picked you beagle and brought them home, you can immediately start beagle puppy training! Beagles are an elite and intelligent dog breed that has been around for over 2000 years. They have an easy nature and their lack of health problems make them a popular choice of pet. And of course, we all know Snoopy – the world’s most famous beagle! Beagles are intelligent dogs but they also have a stubborn side which can make beagle puppy training almost a chore. But if spend the time training your beagle puppy as soon as you get them home, you will quickly gain the rewards of owning a happy, obedient and well-loved member of the family. Firstly, Choosing Your Beagle Puppy! Beagle puppies with their floppy ears and heart melting eyes are hard to resist. Therefore owners often rush in before they truly know the time and care it takes to look after a puppy. So before you rush in and fall head over heels in love you need to know all about beagle puppy training, so you can turn your cute ball of fluff into a great member of your family. Firstly, it is important to make sure you buy your beagle puppy from a reputable breeder. It is okay to ask the seller for references and proof that your puppy is in good health. The owner will probably give you the option of picking out your puppy from a bunch. You may be tempted to pick the boldest and bravest beagle puppy who runs straight up to you. This isn’t a bad thing, but remember the boldest puppy may be the hardest to train! Once you have gone through all the steps of choosing your puppy and bringing it home, you can then begin your beagle puppy training! The Beagle Puppy Training Begins! Beagle puppy training should begin as soon as you get your puppy home. By doing this your puppy will develop great habits for the rest of its life. Beagle puppies learn best by positive and repetitive methods. Rewards work too – beagles love food! The following excellent training tips to follow when your beagle is a puppy. Further training can be introduced as our puppy gets older. House Training: Once your beagle puppy is old enough, you can start with basic house training. This works best if you stick to a schedule, confinement and supervise. Remember to reward you beagle puppy if it goes to the toilet in the right place! This will encourage it to repeat it’s good behavior. Leash Walking: Once your beagle puppy is old enough you can start to teach them to walk on a leash. It is in the beagle’s nature to put their nose down, start stiffing and then just go for it. If you allow this, it will lead to pulling on the leash. So it is important to teach your puppy to walk correctly on the leash from a young age. Basic Commands: The basic commands, sit, lie down and stay, can be taught from a young age. If you repeat these basic commands every day, your beagle will quickly learn them and will remember them for a lifetime. Again, remember to use treats to reward your beagle for their good behavior. Beagle puppy training may seem a lot of hard work but the end rewards are worth it. They are a boisterous and energetic yet adorable breed. But if you spend time and use our beagle puppy training tips, your puppy will turn into a loyal dog and loving member of your family!